While putting away comics in the fifty cent section at the local comic shop that I volunteer at a couple weeks ago I found this hidden gem. I bought it purely for the title. But I knew I had to review it because it was either going to be truly genius. Or it would be so bad that it was at least entertaining. So let’s do this. This book is just what it sounds like. 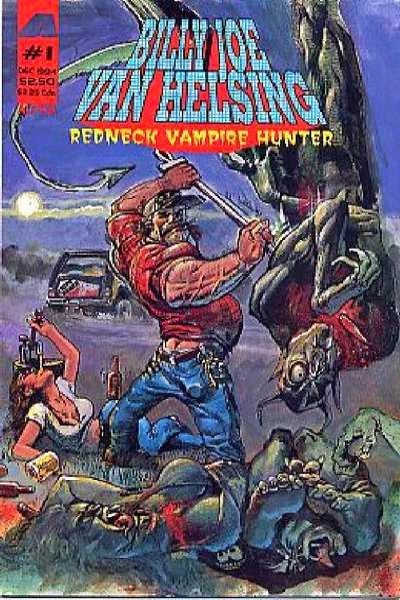 A comical trip into the world of vampire hunting through the misadventures of a self proclaimed two-dimensional stereotype of southern people. The issue is made up of a series of short stories, the best of which features Billy Joe trying to win back his ex Maxi by proving her new boyfriend is a vampire. The true fun of this book is the fact that Billy Joe isn’t really the greatest at what he does. He is often way under prepared for the situations he finds himself in. And he seems to believe that he is also a master of disguise, but actually just gets by on the incompetence of others. Kieffer really likes to have fun with Billy Joe’s accent, and slang. As well as making a lot of pop culture references that the other characters often use to make jokes about how uneducated Billy Joe is. But it never comes off as anything but satirical, when it could easily come off as moronic or insulting. That said, at points Billy Joe’s accent makes it hard to understand what he is really saying. The art is all over the place in this issue. But on the stories with Joe Paradise is on art is when it shines the best. Paradise has the best grip on who the characters are that he is putting on panel. So much so that I would be interested in seeing what his art would look like on a book for a bigger publisher and in color, as this issue is all black and white. This was a really fun read that as far as I can tell there were never any other issues. But I kind of hope there are others. And if there are I would gladly grab them so I can see what other shenanigans Billy Joe gets up to. Thanks for reading. If you have any comments, questions, or suggestions please leave them in the comment section. And as always… Keep reading comics fans.